Most of the prints today need no introduction. Jay Ryan, strawberryluna and Greg have been key contributors to Screens 'N' Spokes since day one. Logan Kornhauser on the other hand is a newb and we are happy to have him. 1. I still remember when Jay Ryan first said he was intrested in participating. It was one of the surest signs that the little show we were putting together might actually work. He helped to put us on the map, and every year since then, he's produced a signature piece. This year, the print is undeniably Jay's style, but it less kinetic then normal, and more contemplative. A still life of a gaggle of bikes. 2. strawberryluna, previously just Allison but now Allison and husband Craig, always bring the cute. In 2007, their "Going to See My Baby" print was a standout, and a swift seller. Allison has since printed up a number subsequent colorways of that print, always donating a protion of the proceeds to the MS Society. I'm thinking this print could be following in that one's footsteps. This past Saturday, it was featured in strawberryluna's sale on curatorial design shop Fab, it sold out quickly there with all proceeds again going to the MS Society. 3. Illustrator and printer Greg Pizzoli has an immediately recognizable style, and this year's print is a perfect compliment to the collaborative print that he and Tim Gough created in 2010. It has been a joy to see Greg's drawing skills and printing skills develop as the student has become the professor over the past 5 years. 4. Logan Kornhauser is the newcomer in this batch, and he has certainly made an impression with a bold and colorful design. Under the sea has been a recurring theme in Logan's work, and it's memorable here complete with mermaids and whales. Today we're bringing you four great new prints. Longtime contributors Cricket Press are back (although this isn't that last you'll hear from them). Sara Turner is joined by newcomers Isle of Printing, Brainstorm and Lonny Hurley. 1. Bryce McCloud, from the Isle of Printing, and I have been talking for the past 3 years. I'm extremely happy to have them finally involved. Bryce produces incredible letterpressed works of art, created entirely from hand-cut wood blocks. The final products are really something to be seen. 2. This is one for all the City to Shore Riders, so it makes sense that Jason Snyder, one half of Philly-based design duo Brainstorm, has ridden in the past. While it's not always this chaotic, crossing that finish line always feels pretty great. 3. Lonny Hurley may have only recently relocated to PDX, but the Northwest has decidely seeped into his design work. Amidst evergreens and snow-capped peaks Lonny imparts words of wisdom from Portlandia: Ride or Die. 4. This year Cricket Press became the most prolific Screens 'N' Spokes contributors to date. With two new designs this year, Cricket Press have designed 6 awesome prints over the past five years. The first print this year is a mysterious woodsy scene from Sara. Could this be the same forrest that Jay and Dan's messengers went riding through last year? Preview #1: Clinton Reno, Landland, Two Arms Inc. It is once again the time of the year when I get to share our new print series with you. This is always so much fun. Over the course of the next week, leading up to the Opening at Mugshots Fairmount on Saturday, October 8, I'll be previewing the 15 new prints. If you live in Philadelphia, and want to jump the gun, you can go to Mugshots or Green Line Cafe, where the prints are already hanging. This year's prints will first be available for sale at the opening, and then will go online for sale through our Etsy Shop on Monday, October 10. 1. Clinton Reno's first Screens 'N' Spokes print comes to you on the wings of birds. I often wish I had a few helpers to carry me across the finish line at the end of long rides. Clinton has a great illustrative style which I've admired for years, and I'm really excited to finally have him involved. 2. We were originally going to working with Minneapolis designers Landland last year, but things didn't work out. I'm really glad they did this year. Landland tend towards a more abstract, sometimes even surreal style than much of the Screens 'N' Spokes oevre. Their first Screens 'N' Spokes piece almost feels like a companion piece to Mark Forsman's 2010 print. 4. This first preview is filled with new S'N'S contributors. Brooklyn-based illustration team Two Arms Inc. designed two killer helmets, one for the man in your house, and the other for the lady. I'll let you decide which is for which, no judegments. Each print is 12x12, LP-sized, and you'll be able to order them seperately or as a specially-priced, matching-numbered, set. This past weekend, amid threats of rain, Team Screens 'N' Spokes took to the road to continue the fight against Multiple Sclerosis. For the past five years the team has ridden in the annual Bike MS City to Shore ride, 75 miles (or 100 if you're crazy like that) to the Jersey Shore and back. Meanwhile, at subterranean health club at the Hotel Conrad, violinist Herold Klein - a 40-year veteran of the orchestra - was on a stationary bicycle turned up to top speed. He planned to stay that way for an hour, preparing for two multiple-sclerosis-related charity bicycle rides, the big one being October's MS Great 8. Covering eight states in eight days, and roughly 75 miles a day, it has been part of his life since 2007 - in part because of his love of bicycling, in part because of his commitment to the MS charities. Normally he rents a road bike, often with cellist Derek Barnes, but such things sometimes aren't available, even in major European cities. "I think we got the only two road bikes in Vienna," he said. And just as Jantsch has studied different running techniques, retooling her own and finding exactly the right shoe to accommodate it, Klein, 66, is used to his bicycle back home, whose materials, weight, and size are as closely tailored to his needs as his instrument. Still, he brought his own pedals on tour, and swears by the psychological benefits that he says come with any two-wheeled vehicle. "There's something about getting on a bike and just riding and riding and riding . . . that if you have a stressful problem to solve, you can do it," he said. I can personally attest to Herold's training paying off. He helped set the pace for me for the final 15 miles of the ride on Sunday. We can't thank the fabulous riders on our team, and all of our supporters and donators enough for helping us make a difference in the fight against MS.
For the third year in a row we've had the privilege of working with Bobby Dixon, the creative mind behind Kollective Fusion, on our Team Screens 'N' Spokes jerseys. In honor of our fifth year riding in the City to Shore, we asked Bobby to design a whole kit, including Jerseys, Cycling Shorts and Cycling Caps. Needless to say, I think we're going to be the best dressed riders on the road. 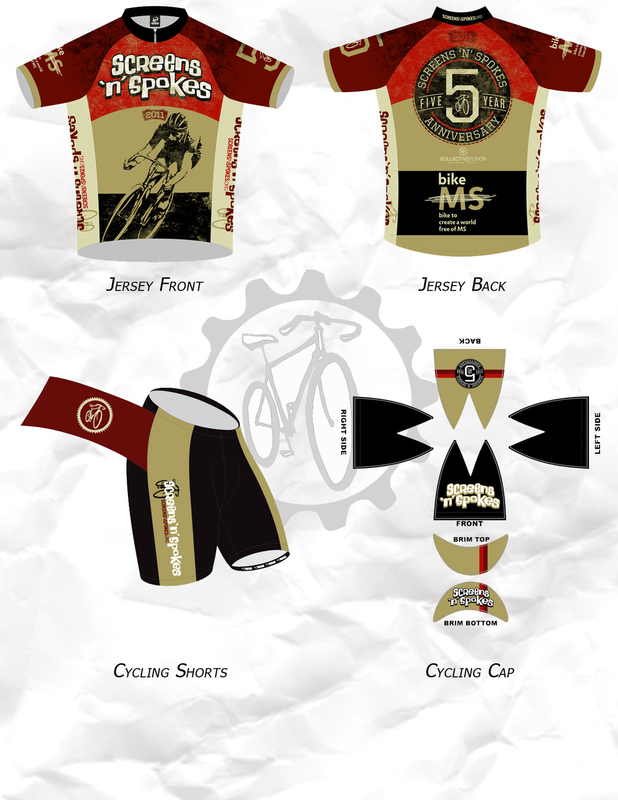 The 2011 Cycling Kit is now available at our Etsy Store. You can be the Jersey, Shorts or Cap individually, or purchase the entire kit and save. These are available for order for a limited time only, and all orders must be placed by Wednesday, August 10th. Yesterday I had the privilege of taking part in some literal bike art. All day long Austin-based Ad Agency LatinWorks was executing a really cool campaign at the LIVESTRONG Headquarters for the Marfa 100 benefit bike ride. The campaign features 100 pre-printed posters that were then embellished with a painted wheel applied by Cancer survivors, LIVESTRONG employees and volunteers riding a stationery bike for 1 KM. All together, 100 KM will be ridden to complete the campaign, and the completed posters will be hung around Austin, Marfa, San Antonio etc. to raise awareness about the Marfa 100, which supports LIVESTRONG and Marfa Public Radio. If you're local, and looking for a fun ride for the good cause, the Marfa 100 will be taking place Saturday, September 10. It's still before midnight on the West Coast, which means I can keep my promise of launching the new site and making the 2011 Artist Announcement on Monday. Hooray! In this, our fifth year, we are still striving to put together a diverse set of prints that will have something that should appeal to everyone. 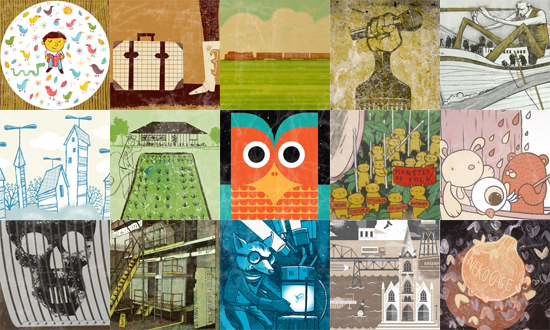 We are expecting 15 fabulous prints from a great mix of artists. Nine of the contributing artists have already been a part of the Screens 'N' Spokes community, including Jay Ryan, Judge, The Half and Half and Greg Pizzoli who have contributed every year. We are also bringing in 6 awesome new artists who will leave their mark. When we began in 2007, we had no idea what we could accomplish. What we did know is that we wanted to join the fight against Multiple Sclerosis, that we had a love of hand-made art, and enjoyed riding bikes. This was long before putting a bike on art became the newest version of "put a bird on it," and we found 20 amazing artists who were willing to donate their talent to this important cause. Since then, we've partnered with over 50 artists on over 80 cycling-inspired prints, and we've built a cycling team that rides in the Bike MS: City to Shore ride every year. With the help and support of so many, we've been able to raise over $200,000 for the National MS Society in four short years. Now, finally, we've got a proper website to showcase all this community has accomplished. Here you will find all the latest Screens 'N' Spokes news, details on every S'N'S print and the opportunity to meet the incredibly talented artists we've worked with. If you like riding bikes as much as we do, you can registered to join our team. and of course you can sign up for our mailing list, like our Facebook page and follow us on Twitter. There are still a few kinks to be worked out, and more info to be added, but we'll be working on it over the coming weeks. We are looking to go 5 for 5, with another great series of prints in 2011. Above, you'll see the great lineup of contributing artists this year, and stay tuned for details on show openings, on-sale dates and more. Thanks for sticking with us, and helping us in the fight against MS.
We made it to the Shore and back! I for one did not think a strong ride was going to be possible this year (my doubt stemmed from my whopping total of two 10 mile training rides ALL YEAR)...but then I went and posted my best time ever. Neat. I'd like to take this opportunity to congratulate each member of Team Screens 'N' Spokes for your hard work and tenacity. You are awesome.